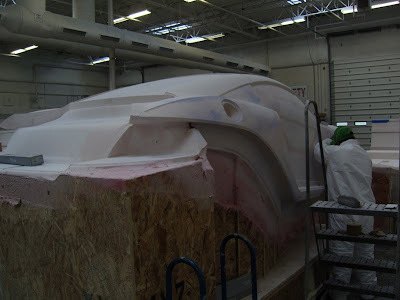 Our body tooling supplier has been working at a fast pace (by no means are the frequency of my posts indicative of their pace...my apologies for keeping you waiting) to have the molds for the hand-laid fiberglass parts complete and ready for shipment here to Wareham. As I mentioned previously, the patterns don't come off the mill ready for mold making. The images in this post show the next step of sanding the ridges left from milling to end up with a smooth surface consistent with the CAD data. The blue areas you see on the center section are areas reflecting low spots in the mold. The blue color comes from applying a dye (Dykem) to the surface of the pattern. As the pattern is sanded, the dye on the high spots of the pattern is sanded away, leaving the low spots clearly visible. 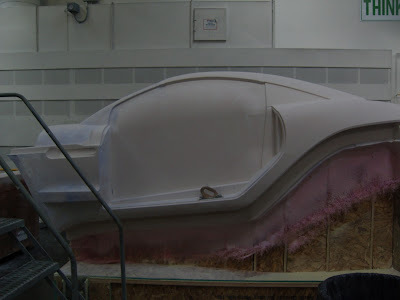 This is a process used in mold shaping, auto body etc and although old school, it's highly effective. Once all of the high and low spots have been smoothed out, the next step of mold generation will begin...stay tuned! Giaonhan247 chuyên dịch vụ mua hàng nhật và giải đáp aliexpress là gì cũng như alibaba là gì và tổng hợp các web mua hàng giảm giá và giải đáp mua hàng trên amazon có đảm bảo không uy tín không.